Do you know one man who crochets? Now I've one thing to say and that's damn it, Janet, let's crochet! Every issue we feature designers from around the globe... take a look at who we've featured so far, their blogs and what we love about them. In the mood for cute or cozy? Hop along to Hopeful Honey. She still makes us berry happy! 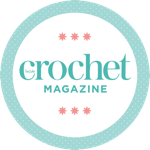 Swing by Inside Crochet designer's delightful blog; Mon Petit Violon. Bear witness to the colour-filled and crafty shenanigans of Julie of Gleeful Things.